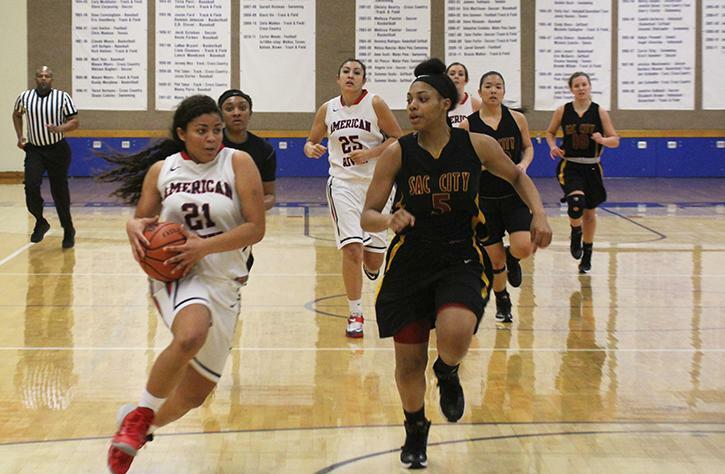 When American River College’s women’s basketball team started the season with a record of 0-5, many players doubted the team could win a single game. “I asked the kids, after the first five games ‘Do you think we’re gonna win a game?’” said ARC head coach J.R. Matsunami. “We hadn’t won, and there were a lot of (players) that didn’t believe we could win,” she said. The team would go on to finish the 2014 season with an overall record of 10-16, and 5-9 in conference. After finishing tournament play in December, the team won two straight games on the road, winning at San Mateo and Sacramento City College in early January. It would go on to lose six of the next seven games, including blowout conference losses against Diablo Valley College and San Joaquin Delta College. Playing at Cosumnes River College on Feb. 3, the team overcame a controversial finish to end regulation and won in overtime 64-59, but would lose its last five games to end the season. In the last game of the regular season, the team lost at San Joaquin Delta College by a score of 91-55. Matsunami says the thing that impressed her about the team’s development was the way they matured as the season progressed. “What I liked the most is … they all grew up. This was a group, none of them knew each other except for Kamari (Hunter) and Demontra (Harrison) before the season, and they all became very good friends,” he said. The team finished the season having shot 30.8 percent from the 3-point line, and averaged 50.2 points per game. Guard Jazlynne Macklin led team in total points with 282, and center Kohl Bryant led ARC in field goal percentage at 39.7 percent. On defense, forward Cassandra Jaimes led the team with 37 blocks and 219 total rebounds and guard Kamari Hunter led the team in total assists with 31 and 55 steals. The team also dealt with injuries and illness during the middle of the season. Guard Zhane Washington missed time after suffering a concussion, and Jaimes missed time prior to the semester starting after surgery on her tonsils. The team was also impacted by a flu virus that made its way around the team. Forwards Haylee James and Jaimes along with Washington all came down with the flu during the season. Matsunami says she believes these factors affected her team. “Just the overall effect on the team, because it changes your substitution pattern. (The virus is) lasting a couple weeks, its not like you can just kick it off in a couple days, its not a 24 hour bug,” said Matsunami of the flu’s impact on her team, adding that other teams had to face the flu as well. Three sophomore players plan to transfer to four-year universities at the completion of this semester. Forwards Erica Bossett as well as James will both transfer to Sacramento State, with Bossett planning to major in kinesiology and James in criminal justice. Macklin will transfer to CSU Monterey Bay, with the intent of majoring in bio-chemistry, and spoke highly of her time on ARC’s women’s team. Macklin plans to keep playing after she transfers, and said she learned valuable lessons while at ARC. “Not quitting is one of the best things I’ve ever done,” said Macklin. Be the first to comment on "Women’s basketball team finishes 10-16 overall"